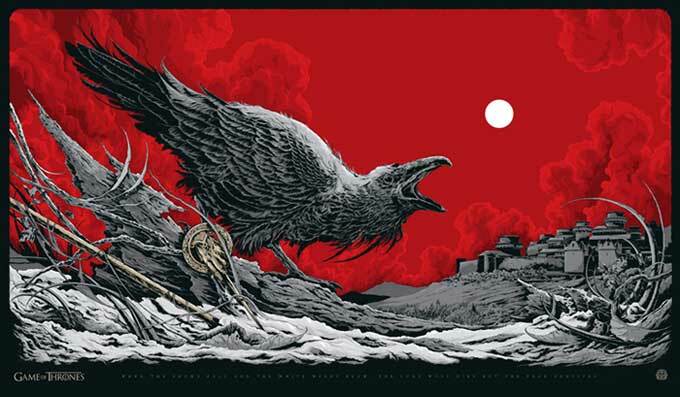 Alamo Drafthouse’s art division Mondo launched a “Game of Thrones”-inspired exhibition at SXSW this year, running through March 14 and showcasing original fine art from Craig Drake, Daniel Danger, Jason Edmonton, Horkey, Jock, Phantom City Creative, JC Richard, Ken Taylor and others. Along with the fine art, Mondo’s partnered with HBO for a run of eight limited edition posters, the first two of which have been on display and were sold at the Mondo Gallery. Two more posters are being released digitally each week leading up to the March 31st “Game of Thrones” season three premiere. Indiewire’s got an exclusive look at the third poster in the series, “Harbinger,” which will go on sale tomorrow, March 14, online at MondoTees.com. 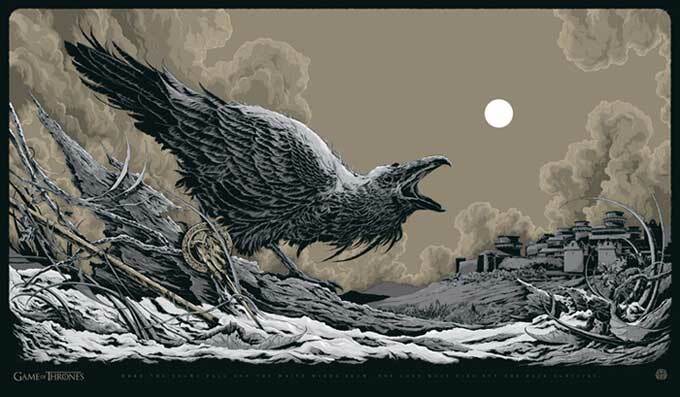 “Harbinger” is the work of artist Ken Taylor, measures 21″ x 36,” and is available in two version. There’s a 440 run of the regular version and a 225 of the variant, pictured below it. The price is $50 for the regular and $75 for the variant. As always, the exact time of tomorrow’s sale will only be announced via Twitter, so follow @MondoNews if you’re interested and be prepared to be very quick on the draw.